Know who I feel sorry for? The poor museum tour guide who has to lead around a busload of academics. Everyone thinks he’s an expert… and probably is. Today I joined a tour of “Spanish Jamaica”, which was put together by the organizers of the Caribbean Studies Association conference. The term refers to the period between Columbus’s “discovery” of Jamaica and the arrival of the British under the command of Oliver Cromwell. It may not have been a brief period, but few beyond bookish academics pay much attention to Jamaica’s Spanish history. In that period, the island was referred to as “Xamayca”, which was a Spanish mispronunciation of the Taino tribal word for something like “land of water and forest”. The tour consisted of a visit to a special museum exhibition, lead by a knowledgable historian. The poor fellow had to deal with frequent challenges to his expertise, though, by we all-knowing and annoying PhDs. Interesting factoid: the Spanish crown had bequeathed Jamaica in perpetuity to the Columbus family. Indeed, Christopher Columbus and his leading heirs were all granted the title, Marquis of Jamaica. The surviving ones still occasionally try to assert their “ancestral” ownership rights! I’m sure the descendents of the Taino, the Aboriginal race who were here when Columbus arrived, and whose culture was demolished by the Europeans, find the Columbian assertion rather drole. 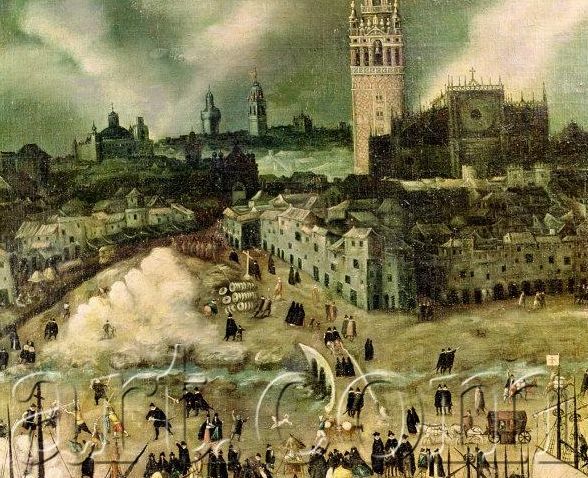 In the exhibit, there was a great panting from 1590 by Alonso Sanchez Coello called “View of the Port of Seville“. If anyone knows where I can buy a print, cheaper than the list price of $180, do let me know!